As a car owner, I always look to park my car in a shaded area. Even when I’m on the move, finding shaded car parking is always an added advantage. Therefore, regardless of whether you’re a home owner or a shopping centre owner, no doubt you’ll want to offer car shade to protect cars from natural elements such as the sun, rain or wind. Whether you’re looking for a cheap alternative to a garage or you’re looking to affordably shade 10,000 cars in a shopping centre car park, you certainly have a range of options to choose from. As one of Australia’s leading shade solution providers, in this article I will list out 5 of the cheapest and most effective car shade ideas for you. Listen up! I always tell clients who are looking for cheap and effective car shade ideas to consider shade sails. Shade sails, such as ours at Global Shade, are lightweight, easy to install and come in a range of designs and colour options to choose from. The best part about shade sails is that they are available both in standard prefabricated sizes and can also be customised to meet specific requirements. For those clients who are concerned about water seepage in car shade structures, fortunately, you can get waterproof shade sails. Cheap and easy to obtain, our waterproof shade sails offer the added advantage of waterproofing, in addition to standard shade and protection from the sun and wind. These sails can be set up with minimum fuss and are incredibly robust as well. As with other types of shade structures, waterproof sails are also available in a variety of colours and designs. Whilst not surprising, clients often ask me for robust and permanent car shade solutions that won’t break the bank. I suggest shade structures such as cantilevers to such customers. Consisting of steel frames which hold a heavy duty PVC fabric together, curved cantilevers provide all-weather and all-round protection to cars. 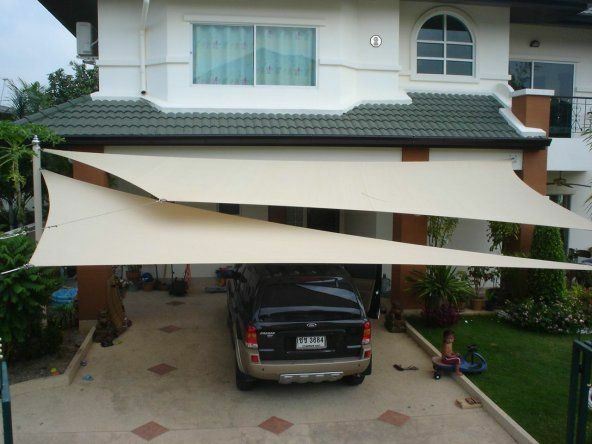 Quality cantilevers, such as the range we offer are a cost effective permanent car shade solution. Cantilevers are available in a range of designs and can be accessorised to include electrical fittings, heating and drainage options. For clients looking for an extremely sturdy, permanent and robust car shade solution, I turn them towards steel structures, such as canopies and tension membranes. Steel structures are indeed the most robust car shade solution and they are extensively used across commercial locations. They typically feature PVC or some other heavy duty fabric to provide protection from the sun, rain and the wind. While such structures definitely work very well as a car shade solution, they are significantly more expensive than the other options that I have mentioned in this article. For this reason, they are most commonly used for commercial applications such as shopping centre car parks. Carport kits are a popular car shade solution in Australia these days, and clients often ask me how effective they are as a viable shade solution. While carport kits are incredibly cheap, extremely easy to setup and can be quite effective in limiting direct overhead sunlight from falling on a vehicle, they are however, known to be flimsy and they can take off or collapse in a storm. While they are definitely the cheapest option, they do have strong disadvantages which you won’t find from the other car shade solutions mentioned in this article. Carport kits are only effective as a temporary shade solution. There are several car shade options that are cheap, effective and easy to install. If you’re looking for such a car shade idea, you should choose from shade sails, shade structures and cantilevers and waterproof sails and structures. All of these products can be found with us at Global Shade and they are incredibly easy to set up and maintain. Steel structures are a more permanent and robust option for you, but they are significantly more difficult to install and cost more than the first three options. While you can also opt for carport kits as a cheaper option, these are only a temporary solution and they will not withstand heavy rains or storms. Here, at Global Shade, we are a specialist Australian provider of shade solutions. For more than 25 years, our shade products have been widely used across several applications, including car shades. Take a look at our product portfolio to discover the various shade solutions that we provide. Not only are our products effective and affordable, but they are easy to install as well. We supply our products all over Australia, so wherever you are, get Global Shade products today!